The wormhole of musical superstardom closes and opens at random. Right-wing lurches, shifts in culture and good taste lift some boats while iceberg-ing others. Young Fathers surf these waves by keeping themselves guessing. Even before they released the career-making Tape One on L.A.’s Anticon, they were writing songs in a visceral stream-of-consciousness—improvisation concentrated into fury and lust. They aren’t superstars, but they should be. They’ll be doing Drake-like stints at Staples if it’s up to singer Alloysious Massaquoi. Ahead of the band’s Friday, Nov. 9, set at the Fonda, he talked about their pop-leaning, course-altering latest album Cocoa Sugar, L.A.’s oblique influence on their music and the thrill of collaboration. This interview by Tolliver. Y’all have put out great album after great album. Obviously there’s a lot of acclaim. From a purely careerist standpoint, what is left to accomplish? How big do y’all want to get? Alloysious Massaquoi: There’s no fear in us wanting to be as big as possible, man. I think we find ourselves in a strange area where we’ve been around for a while but it still feels like we’re at the tipping point. Moreso now with the new record and a bunch of new videos that we’ve done. We’ve opened up a bit more, collaborating with other directors and things like that. So it’s a steady growth and you gradually get to a place where … I just want the masses to come around to our stuff. To be in a line with the Beyonces, the Kanyes. Now even Childish Gambino—he’s managed to do that jump from being the awkward nerdy black guy to… [gestures upward] … just from pure creativity. So you want to be in that realm. I want us to be in that realm where you’re just considered as well. That’s the ultimate goal for me, anyway. I can’t speak for the guys. It’s a slog, though. It’s a long journey. I think it’s just about evolving, keep progressing, try new stuff, making yourself feel uncomfortable—all that kind of stuff. That’s all you can really do, mate. Was that kind of ambition there from Tape One? Alloysious Massaquoi: We’ve never shied away from pop music or having a trajectory—never. I think we just want as many people to hear the music as possible … and it to be somewhere. We still believe in the power of music and it changing things and people’s minds and whatnot. But now it’s about being more strategic and having things in place to allude to that vision. I think that’s probably the best way of doing it. It’s been a learning curve for us. Everyone gets our stuff when they see us live. We’re not necessarily prolific online, but when we do our shows folks turn out. It’s a slow and genuine following of people that turn up to our shows. I think we could improve online. It’s that kind of thing where when you take a photo of us … if you see us live, you essentially want to see that but in a photo and online—because people get it—people understand it. From Tape One it was more about a release, just putting something out. We’d been recording since we were 14. Nothing had come out. So it was just like … you do something in a week, and whatever state it’s in, you put it out. From that we got signed to Anticon, we went to SXSW for the first time and kind of went on from that. We had a domino effect and we progressed and now we’re here. Speaking of Anticon—are y’all still in contact with them? They’re a legendary L.A. label. Alloysious Massaquoi: Unfortunately not. That was it. We did the deal and that was really it. No potlucks at their house? Alloysious Massaquoi: [laughs] It is what it is. You’ve worked with Danny Boyle, done some live scoring. Do you have any other big bombastic ideas you’d like to try? Alloysious Massaquoi: Just keep it simple, just start collaborating. Essentially we’ve been collaborating since we were 14. Everyone’s accepted for who they are and championed to excel at whatever they feel. It’s just letting other people in the camp that we want in the camp. It adds more substance, adds more flavor and it takes it somewhere else. Sometimes you might have an idea, but you won’t get off the ground because you don’t have the know-how. A lot of people have the technical ability. It’s being open to that and understanding that there’s limitations—there’s things that you just can’t do from a technical point of view. As long as we have creative input, that’s the collaboration part. Where we can oversee stuff and be part of something—and if we can’t, then trust that the person who takes on the job can nail it and gets the group. It’s hard to find people who get the group or where we’re coming from. You have to find that trust. I read in a Guardian piece earlier this year that you tried to move toward pop structures for Cocoa Sugar. Is that where you still are musically? Alloysious Massaquoi: It stems from us wanting to do something that makes us feel uncomfortable. I personally enjoyed this whole process from start to finish because I felt that it was something that we needed to do to get to the next point and to add this process into our arsenal. I feel like when you look at the greats—I read up on a lot of this stuff and watch a lot of interviews and whatnot—and the greats are quick at deciding what’s good and what’s not and moving on. And we like to work really fast. I think that process kind of cemented us in going like, ’This works, that’s the melody, have you got any words? OK, those words are the best words.’ And then you work song structure. And that for me felt a lot easier because you never have to write as much. It felt a lot easier. There was starting and stopping [during sessions for earlier albums]. Before … you get into a vibe and everybody would be like going for it. And then you do it for awhile and then we start arranging it in a more organic way. But this whole process was as soon as someone had something good, it was like, ‘Cool, that’s it—write something. That’s the melody.’ Just being more structured. I think the other guys didn’t really enjoy that process. But it doesn’t really matter because we created what we created and everybody in the world loved what we’d done. Whether I enjoyed it or blah di blah di blah or vice versa, it doesn’t really matter. I think as long as you get the songs there and you try stuff and try to be a bit more direct and like … sort of ‘pop formula.’ I think it essentially just stripped away a lot of the fluff and got to the essence of the group. We love a lot of melodies and we love to paint pictures in people’s minds and use interesting words. It was always there, but that was the process. It’s funny—my perception is that all of your albums are catchy. Alloysious Massaquoi: When you have something to aim for, it does affect the morale of the group. We were all gravitating that way anyway. I think it’s just applying what we do on to that concept and seeing what happens. I’m confident in the guy’s and I’s abilities. If we went, ‘OK. Let’s approach rock music. Let’s approach that and see what would come out.’ That ended up sounding like White Men Are Black Men, Too, to be honest. Because we sounded like an indie band. We approached the pop formula to see what happens, and this is what happened—Cocoa Sugar. You get to a place where you’re confident in your abilities and you’re confident in what the group can actually make, and that excites us. We don’t have a prewritten plan. There’s no blueprint for what we want to do or where we’re going, y’know? I think that’s what keeps it exciting. It’s just being confident in the group’s ability. I think everybody’s confidence level is different, and everybody gets there in the end. It was a confidence thing—this whole process. I really didn’t want to get into politics, but do you worry that as the world seems to get more conservative that there will be a backlash against forward thinking music? Alloysious Massaquoi: I think the only thing that would happens is pretty much what’s happening now which is like … folk don’t hear about it. The finger isn’t being pointed at these bands or at these people. You have somebody who’s really talented and they only have so many views. You have someone who’s not as talented but they’re really good looking and they fit this thing … whoosh. That’s just the way and everyone knows that’s how it works. So if you’re doing anything that’s political or forward-thinking, you sort of get bracketed into that whole thing of being alternative. Alternative to what? What are you alternative to? That’s what you’re having to battle. You don’t have to make music like this for it to come across, you don’t have to make straight down the line stuff to have substance. It’s a hard place to be. I can’t say exactly, but it’s probably no different. You just won’t get heard. Y’all have played Hollywood Bowl, you’ve played Moroccan Lounge and now you’re playing the Fonda. Do you take a different approach when playing an amphitheater versus playing a club? Alloysious Massaquoi: I don’t think we do, but it does change things. I think we prefer those kind of 8 Mile type venues where folk come right up to the front. There’s no barriers that separate people. I hate that because it feels like there’s a disconnect between you and the audience. You want this whole exchange of language. You do something, they do something. They respond, you respond. You get more energy, they have more energy. Back and forth, y’know? When you have those barriers in between it feels like it cuts that or stems the flow, and you feel you can’t perform as much because there’s a gap. With the smaller venues people are right there and you feel more connected. But you just approach it like any other show. Big or small—it’s still the same thing. You want to come across. You want to justify yourself, justify the group, justify why you stand out. I see this parallel between L.A. being this city of disparate parts coming together to make something work, and y’all’s music being a melding of genres. Do you take inspiration from this city? Alloysious Massaquoi: I take inspiration from pretty much anything. In the last year everybody’s banging on about self-love and all this kind of stuff. I think that should just be a way of life. It’s good that these things are kind of put forward now and it’s cool to look after yourself and your health. In the last year I’ve been spending more time with family, regulating friendships. I think all that seeps in—all that helps. Conversations that you have with people, all that filters in somehow. Things that you see, stuff that you read, interactions with people it adds something. We recorded one of the songs in L.A. and Kayus [laughs] … he got high. He was a bit useless that day, but we recorded something. It’s weird like … being in L.A. It made sense a lot of the music comes from America. It all sort of … it’s to do with the sun. There’s a lot of sun. And when there’s a lot of sun you want to make music that suits that sort of environment. That was kind of a revelation to me. You think of the places up north and its all dark and melancholic and all this kind of stuff. One of the songs we’d done was ‘Soon Come Soon.’ That was a couple years back. That had that sunny feel. Without even saying anything, everybody just felt that was the vibe. We made something that was a bit more brighter or colorful. I think all these things filter in. But there’s no point where you’re like, ‘I’m getting influence from this, take me to this point.’ It’s not as obvious. So you’re not going to write a song about driving down Sunset? Alloysious Massaquoi: We recorded like thirty songs for Cocoa Sugar, but we couldn’t fit them all because it would just be too long. If you take one song out and put something else it would change the whole dynamic. There was one song about Hollywood, actually. [singing:] “If I go to Hollywood / Would you call me a stranger?” Something like that. You don’t have to be in Hollywood to write a song about Hollywood. It all seeps in, it all filters in somehow from experiences and going places. There’s no definitive point where you’re like, ‘Oh, I’m gonna go there on the 30th of November so I’ll write.’ It just comes. 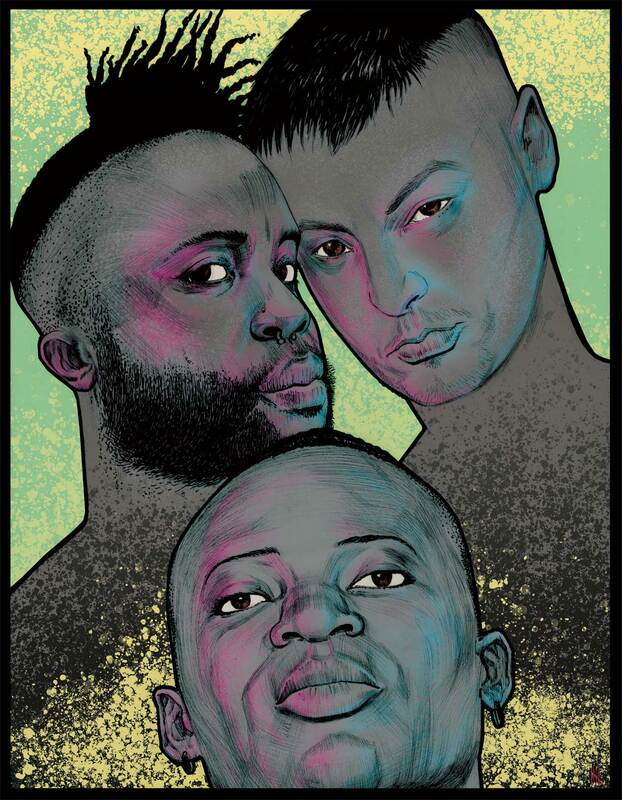 YOUNG FATHERS WITH ALGIERS ON FRI., NOV. 9, AT THE FONDA THEATRE, 1626 HOLLYWOOD BLVD., HOLLYWOOD. 9 PM / $23 / ALL AGES. GET TICKETS HERE! YOUNG FATHERS’ COCOA SUGAR IS OUT NOW ON NINJA TUNE. VISIT YOUNG FATHERS AT YOUNGFATHERSOFFICIAL.BANDCAMP.COM.